I don’t know very much about antiques and have certainly let some items go very cheaply but if they have a new home and aren’t just stuck in a box, that’s fine. I can’t quite bring myself to dispose of this elegant Arzberg Bavaria porcelain cup and saucer and would love to know more about it. The Arzberg Bavaria mark on the base is of a crown (joined at the top with a star) on top of a quartered shield of which 2 opposing diagonal quarters have the letters P (top left) and A (bottom right). Wondering does P and A stand for Porzellenfabrik Arzberg? The other quarters are filled with diagonal lines. Beneath the shield the 2 lined script reads ‘Arzberg Bavaria’. 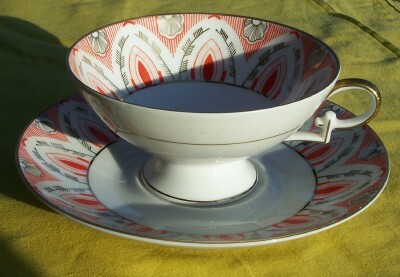 The base of the saucer is also marked with a gilded 80 and the cup with a gilded 22.